Can you tell me how you obtained those stats, please? I'd love to have that facility on my blog. Also, has Bloggers4UKIP considered becoming a blog catalog for UKIPers? the increase in backlinks to your site would increase your traffic. Just register at extremetracking.com for a free tracker. There are links to other UKIP blogs on the sidebar. If we find them or someone tells us about a UKIP supporting blog I add them in. I am sorry to sound stupid but what does it all mean. When someone visits this blog from Google it's possible to tell what they searched for to get here. As you can see from the screenshots, the Guernsey government ended up here and the European Commission are Googling for Marta Andreassen (and ending up here). Marta must have them worried. I agree with Bob Feal-Martinez. I dont have the foggiest idea what all these statistics means. Even after you explanation, I am still none the wiser. 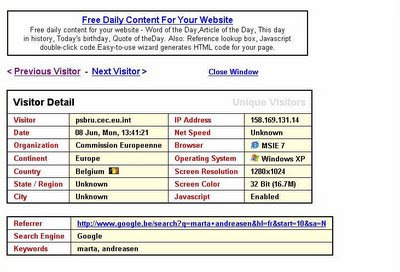 It means the European Commission has been searching for information about Marta Andreassen and ended up at Bloggers4UKIP both directly from a Google search and via the British Democracy Forum. 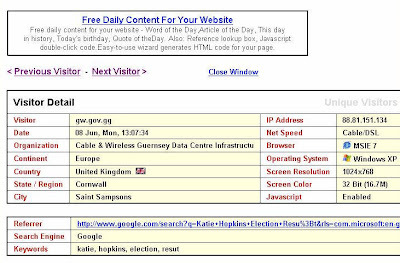 And the Guernsey government ended up here through some apparently random search.